Chicken Tikka Masala, fragrant basmati rice with cardamon and of course Naan. I decided to call Elliot, my son, for advice on baking naan, an Indian flatbread. Since he spent some time in India, I thought perhaps he would have some insight and was surprised when he told me he had just made it a few nights ago. He steered me to google....remember when we just had encyclopedias? Anyhow, he guided me to this lovely woman, Manjula, who has a series of YouTube videos...I love her! I followed her recipe! It was fun to make and worked out perfectly. Naan is traditionally cooked in a clay oven or “tandoor.” This recipe uses a regular home oven with a pizza stone. Dissolve active dry yeast in lukewarm water and let it sit for 10 minutes or until the mixture becomes frothy. Add sugar, salt and baking soda to the flour and mix well. Add the oil and yogurt mix, this will become crumbly dough. Add the water/yeast mixture and make into soft dough. Cover the dough and keep in a warm place for 3-4 hours. The dough should almost be double in volume. Heat the oven to 500 degrees with pizza stone for at least thirty minutes so stone is hot. Using a pizza stone will help to give naan close to same kind of heat as clay tandoor. Next turn the oven to high broil. Knead the dough for about two to three minutes then divide the dough into six equal parts. 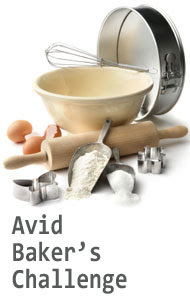 Take each piece of dough, one at a time, and roll into 8-inch oval shape. Dust lightly with dry flour to help with the rolling. Before putting the Naan in oven, lightly wet your hands and take the rolled Naan, and flip them between your palms and place onto your baking/pizza stone into the oven. You can place about 2-3 Naan on the baking/pizza stone at a time. The Naan will take about 2 to 3 minutes to cook, depending upon your oven. After the Naan is baked(Naan should be golden brown color on top). Take naan out of the oven and brush lightly with clear butter or ghee. wait 2 to 3 minutes before baking the next batch of naan. It gives oven the chance to get heated again to max. I served it with Chicken Tikka Masala and Fragrant Basmati rice. The recipes can be found in Dave's Dinners by Dave Lieberman . Looks great. Naan is so good with those slightly charred areas on it. Thank you for this video. My daughter wants to make naan for pizza. I'm guessing that you need to flatten the bread by poking a hole in it? Your recipe looks super easy! 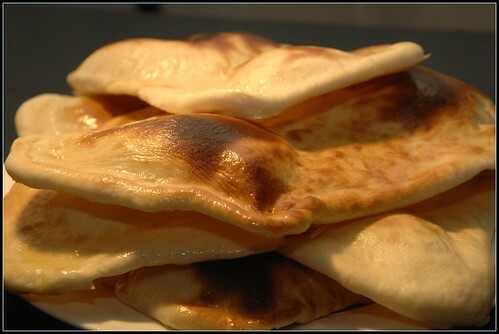 I love naan and always buy it at grocery store..but after watching your video..I'm going to try and make my own. Thanks! No actually the naan comes out like that so no need to poke a hole. It is naturally a flatbread. Yes I was surprised how easy it was. It was fabulous! You need to brush it with the ghee or butter when it comes out of the oven. My name is Penny and I am a passionate baker - like my mom! I particularly love baking bread as well as cakes, cookies, pastries etc. 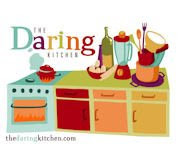 I am a member of the Daring Bakers and the Avid Bakers and enjoy sharing my baking, as well as my travel experiences with others... like you. I hope you enjoy my blog and try some of these recipes! My Mom was a passionate baker...always in the kitchen. The wonderful aroma of cakes and cookies was always present in our house, a comforting very special feeling. I remember clearly how she would tell us not to jump around when a cake was in the oven. This blog is in her loving memory and all of the recipes that came out of her kitchen. Check out my new Travel Blog!